So looking at my renewal options tonight on the DW Ticketing page and stumbled upon 'Festival Street Market' under the 'Shows & Events' Tab. Celebrate Christmas at Dreamworld’s Festive Street Market on Friday 1 or Saturday 16 December, showcasing international street market stalls, live music and entertainment. Premium VIP packages available at Tiger Island and Brock’s Garage on selected dates. Now my initial thought was "awesome! It's like White Xmas combined with Carnivale!". Exactly what DW needs! Then clicked on the dates to realise the basic price without the Premium VIP packages is $110pp. $160pp if you want to eat at Tiger Island. No passholder discounts, and price doesn't include access during the day of the event, just from 6:30pm-11pm. For a park that is struggling to claw back its lost visitation, you'd think they'd be trying to put together Affordable family-friendly events that will bring back groups of people. This isn't pitched as a corporate style Xmas party by the spiel provided, it's just a generic public event. The fact that it's restricted to over 15s is also self-limiting (given FN's isn't even age limited and would surely have stronger themes than a Festival Street Party at Xmas). On first glance this just sounds completely lacking in rational thought to me. As I stated, I was only on the ticketing page (as per my screen shot). I hadn't even seen the page you linked to as I wasn't looking for it. Dreamworld have gone the high end night events route before with their Tiger Island events. I wonder if $100 includes a basic drinks package and festive foods? It might be that rather than trying to compete with Movie World's model of ram the park with 6,000 or so people who paid piss all and don't get to spend in the park because of the crowds and leave cranky and annoyed, Dreamworld have gone the 'We'd rather have 1,500 who we know we've got $110 out of and know they'll leave happy. Put in perspective Outback Spectacular is $100 for the 'basic' dinner, a couple drinks and the show package. 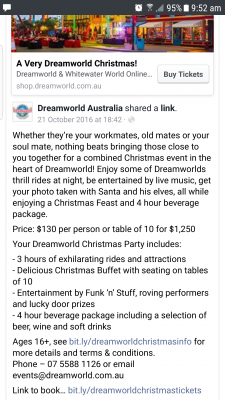 $110 for dinner drinks and a theme park with added entertainment, yeah maybe that might work as a value propisition to some. If it doesn't include anything extra then you'd be wanting a pretty amazing couple of headline acts. I hope it works, but it's probably a little out of my price range, and that's despite the fact I normally spend $40odd everytime I visit the place. Remember they were advertising that group Xmas party event last year at a similar price? Where it was like $100pp and you had to book a table of 10 (or something along the lines of) and included a drinks package, entertainment and what not. That whole event was scrapped after the incident, so it sounds to me like this may be a second attempt at reintroducing the same concept?